About 300 members assembled at the Vale Resort in the Vale of Glamorgan on Saturday 2nd April for the AGM under the Presidency of Mr Dai Harris, Pennal Stud. There were several members present from the Continent and some from as far afield as South Africa. The President commenced the Meeting with reference to a number of members who had passed away during the year including our Chairman Mr Geraint (Tom) Hughes, Ionos Stud who had recently passed away suddenly at the age of 57 years. Mr Stewart Franklin, Chair of Finance presented the Balance Sheet for the year ended 31st December 2015 which showed a deficit of £33,081 (on a turnover of £1,748,567) partly due to a reduction of £8,959 in membership fees and £7,886 in registration and transfer fees; registrations had reduced from 11,703 in 2009 to 8,347 in 2011 and 4,746 in 2015. The 4,746 registrations were divided into section A: 1,586 (33.4%), B: 524 (11.0%), C: 685 (14.4%), D: 1,268 (26.7%) and WPB: 683 (14.4%). Exports had kept up well at 475 led by 141 to Germany, 101 to Holland, 67 to France and 53 to Sweden. The Brodrick Memorial trophy, the most prestigious award of the Society was presented to Sarum Stud’s Heniarth Quinnell whose son Sarum Rembrandt was 2015 Supreme Ridden pony at HOYS, another son Powys (NL) Sprite was 3rd at HOYS and best of breed at Olympia and daughter Brynodyn Savannah was reserve overall ridden champion at HOYS in 2011. Honorary Life memberships were conferred up Mr Clive Hoyles (Llangybi Stud), Mr and Mrs Eric and Dilys Roberts (Erdyl Stud) and Mrs Diana Thomas (Dyfed Stud). Mr John Kirk, Vice-Chair of Council referred to the splendid work which the late Chairman, Mr Tom Hughes had undertaken during his year of office. 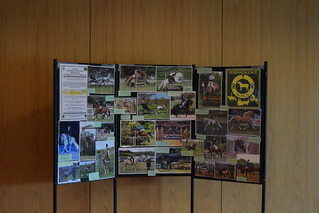 He also referred to the spectacular 5-minute video (shown at the Meeting) of successful HOYS 2015 Welsh exhibits produced at no cost to the WPCS by Boom Cymru. Pasadoble (B) and Anstar Prince Royale (B), Glynwyn Charlie Brown (C and champion), Llafar Matador (C and reserve champion), Winton Romany Prince (C) and Meiktila Celt (C), Ronin Black Flash (D), Alltwalis Jack (D) and Derwen Sior (D). The artist Debbie Dunbar presented her section A Royal Welsh Overall champion painting to Mr and Mrs Donati’s Ceulan Calon Lan and also presented a surprise painting of Calon Lan to his breeder, Dr Wynne Davies. Since artist Christine Latter had already presented 2014 Performance Show champion paintings to Violet Ward’s Dycott Mark of Excellence (C) and India Latter’s Powys (NL) Sprite (A), she painted the first reserve Catherine Westran’s Darcie’s Law (WPB) who received the 2015 painting. Representatives of Brightwells presented 2015 Sales trophies to The McNeal family of Hillgarth (Autumn Cob Sale Champagne Moment), Mr Robert Hensby of Laithehill (Fayre Oaks Champagne Moment), the Jones family of Fronarth (Overall Challenge trophy), Mrs Julie Evans of Haighmoor (highest-priced brood mare), Fronarth Royal Queen (highest-priced foal) and (joint) Messrs Eddie and Mark Tamplin’s Griashall Legend and Mr S D Walker’s Littlebyrom Harry Potter (section B). Before starting on his Publicity Officer’s report, Dr Wynne Davies referred to the great loss which the Society and in particular the Publicity Committee had sustained by the death of our Chairman Mr Tom Hughes and extended sympathy to Sarah, Nerys and Daniel and their families. The Publicity officer has dealt with several requests passed on from Bronaeron and direct from members also supplied 21 reports which have appeared on the WPCS web-site and been translated into various languages which have appeared in Overseas Journals. Many thanks to Anna Goodwin for undertaking the placing of the reports on the website. There have also been reports on the web-site and in publications by Owen Griffiths, Mili Lampard, Iola Lloyd-Hughes, Elaine Price, Nicki McGuire, Janet Hardy, Judy Pring, Marie Cobley, Jane Hunt, Karen Cheetham, Angela Kember and Hannah Caunt. Many thanks to them all, without their assistance, the Publicity Officer would have had to retire! After nine very successful years, Jane Weller sadly decided to retire from being the Organiser of the Performance Competition. This task involves an enormous commitment over the whole year and we are greatly indebted to Jane and her team of helpers for taking this competition from strength to strength. We are very pleased that Jo Filmer of the Longhalves Stud has volunteered to take over this competition and with her daughter Rosie, we are guaranteed professional photographs. We hope that members will give Mrs Filmer the same level of support and 2016 entry forms were available at the Meeting. presented the retiring President with an album of 60 photographs to commemorate his year of office and Mr Peter Jones proposed a vote of thanks seconded by Mr Gethin Williams. Mr Harris then presented the incoming 2016 – 2017 President Mrs Betty French of the Forlan Stud with the Chain of Office and Mr Ifor Lloyd was elected President-Elect by ballot of the members. Also as a result of the ballot, the following were elected to serve on Council for three years 2016 – 2019: Mr Roger Davies, Mrs Ann Holland, Mrs Tracey Hook, Mr Peter Morgan and Mr David Roberts, and to fill a vacancy Miss Deirdre Chambers for two years 2016 – 2018. Of the 756 voting papers received, 749 were accepted and 7 were rejected. Of the 810 voting papers received, 805 were accepted and 5 were rejected.